Need a Solicitor for a Police Station Interview? Call Us Now! Our Specialist Criminal Defence Solicitors have considerable experience and an excellent success rate at defending and representing clients at the Police Station. 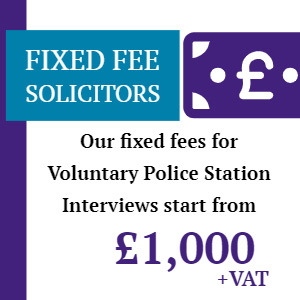 If you have been asked to attend a Voluntary Police Interview as a suspect in a criminal offence, contact one of our lawyers on 0345 222 9955 or send us a message via our enquiry form at the bottom of this page and we shall call you back to explain how we can help and to provide you with details of our fees. The police will usually conduct a ‘Voluntary Police Interview Under Caution’ when dealing with certain types of criminal offences, or where they are dealing with suspects that have not been involved in the Criminal Justice System and are of a professional background. If the police officer dealing with the case takes the view that the suspect will co-operate with them by attending the station on an agreed date and time, they will be offered a voluntary interview. 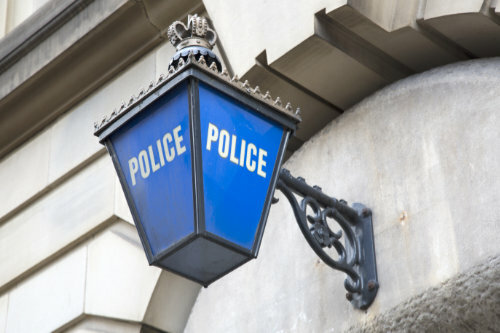 If a voluntary police interview under caution is suitable, given the nature of the offence and given the circumstances of the suspect, the police officer will contact the suspect to arrange a date and time for the interview to be conducted. The advantage of arranging a voluntary police Interview is the suspect is not under arrest and the interview is usually arranged to take place in the form of a pre-agreed appointment, which is more convenient for the suspect and the police officer investigating the allegation. If you have been contacted by the police to an interview, you should be aware that you are attending as a suspect in a criminal investigation, and it is not ‘a quick chat’. So that your rights and interests are protected at the interview, you should give serious consideration to appointing a lawyer as soon as possible so that you receive the right legal advice before, and during the interview. If you decide not to co-operate or attend the voluntary police interview, the likelihood is that you will be arrested by the police. As an exclusively private funded law firm which frequently represents company directors, professionals, business owners and public figures, we only accept cases on a private fee-paying basis (Fixed Fees). Paying privately for a specialist lawyer for legal representation at the police station will provide you with the best possible chance of a successful outcome and higher quality legal representation. If the police officer dealing with your case believes a voluntary interview is not suitable or if you have declined to attend, the police may decide to arrest and detain you so that they can ask questions regarding the allegation. A suspect can be arrested from their home, place of work, a relative’s home or whilst in a public place. If you have been arrested, you will be detained at the police station and once they are ready, you will be interviewed as a detained suspect, as opposed to a voluntary attendee. You will not have the right to leave the police station whilst under arrest. “You do not have to say anything, but it may harm your defence if you do not mention when questioned, something that you later rely on in Court”. In most circumstances, you will then be handcuffed, placed in a police vehicle and taken to the station. If you appoint one of our specialist Criminal Defence Solicitors to advise and represent you at the police station, when we attend the station (with you) we firstly speak with the police officer dealing with your case and will obtain ‘Police Disclosure’, disclosure is the information / evidence the Police have against you and details of the crime you are suspected to have committed. If you attend the police station without a lawyer, you will not be provided with pre-interview disclosure or legal advice. We are skilled at obtaining detailed disclosure from the police, which results in our clients being better prepared for the interview. Once our lawyer has obtained pre-interview disclosure we will attend you in a private meeting room at the station where you will be informed of the evidence the police have, you will also be advised of the law in respect of the offence you are being investigated for. The lawyer will then consider the evidence along with your version of events and will advise you whether there is a defence available and will advise you on the best course of action to take, based on your individual circumstances. Whether you are being interviewed as a voluntary attendee or have been arrested, the process of the interview itself is fundamentally the same. The only difference being, a voluntary attendee has the right to walk out of the interview however, the likelihood is that if a voluntary attendee took this course of action, they would be arrested by the police and detained. If you choose to appoint us to advise and represent you, we will remain with you during the actual interview and will intervene if the police are asking inappropriate questions, or questions they should not be asking. We shall also advise you if there are certain questions you do not have to answer. Having our representation at interview will increase the chance of the case not progressing to formal charge. if, however you are subsequently charged with a criminal offence it will ensure that your defence is properly established from the outset and will provide your case with a solid foundation. We have been representing clients for many years and the benefits are clear. As our clients are paying privately they receive a much higher standard of legal skill, experience and attention. This enables us to dedicate more time in preparing the case, compared with firms that may also offer public funded work. Legal aid lawyers (Duty Solicitors) are often over-worked and are covering more cases than they should, as the nature of their work is not very profitable, and this can result in your case not receiving the time and attention it truly deserves. Robust preparation is the key to building a successful defence and our lawyers leave no stone unturned when instructed. Our lawyers are specialists in their field, have significant experience and will have dealt with other cases like yours in the past and will know the best strategies to achieve the best result. All our Criminal Law Solicitors and Barristers have significant experience of the Criminal Justice System and the police interview stage. Our solicitors understand that the foundation of a criminal law case is established at the police interview stage, as it can have a significant impact on the outcome of the case, should you be charged, therefore it is crucial that you receive the correct and experienced advice from one of our lawyers. If you appoint one of our experienced solicitors, you will be properly advised and represented at the police station and you are less likely to be charged with a criminal offence. Our solicitors will be able to advise you in answering questions or whether you should exercise your right to silence. Our solicitors will also be able to advise you about alternatives to being charged, such as accepting a police caution and will advise you on the implications on your career. Our team of experienced criminal defence lawyers have considerable experience and a background in representing hundreds of clients for all types of criminal allegations, from murder through to assault. Our extensive experience of serious crime places us in an excellent position to represent all manner of criminal and driving offences. Our Road Traffic Offence Solicitors have represented clients for all driving offences at the police station from death by dangerous driving through to drink driving. If you are being investigated for offences such as death by dangerous driving, death by careless driving or dangerous driving the police should provide you with an opportunity to give an account, and as such will ask you to attend the police station for an interview under caution.